Porcelain veneers are an excellent cosmetic dentistry option for transforming teeth that are severely discolored, chipped, broken, misshapen or irregularly spaced. And with proper oral hygiene at home and regular dental checkups, they can give you a beautiful smile for many years. However, over time you may notice that your veneers have become discolored. Fortunately, there are steps a dentist in Mount Pleasant can take to restore your white, gleaming smile with porcelain veneers. How Do Veneers Become Discolored? Gum recession can happen as we age and this can leave a narrow but visible space between the edge of veneers and your gum line. Also, the cement that holds a veneer in place may be exposed as a result of recession; coffee, tea, wine and other dark beverages and foods can stain dental cement. If you sustained a traumatic tooth injury as the result of a fall or blow to the face, then the dentin layer may have been hurt, too. When dentin is damaged it tends to turn yellow, and this can make your veneers look off color. Are your veneers more than 20 years old? Then they may not be made of porcelain, but a plastic that is not of the same quality as the veneers used today. Also, composite resin veneers are susceptible to staining—not as easily as your natural tooth enamel but they can discolor. It may be tempting to try an over-the-counter whitening system when you see that your porcelain veneers are no longer as white as they used to be. However, veneers really don’t respond well to these. Speak to your dentist instead. 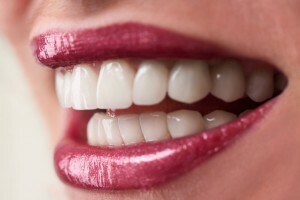 If the stain on your veneers is light, then the dentist may be able to polish it out. However, severely stained veneers—whether porcelain or composite—may need to be replaced. How Can I Avoid Stained Veneers? To prevent stains, be sure to brush and floss your teeth that have veneers just as you do your natural teeth. Use a toothbrush with soft bristles and fluoride toothpaste that will help keep the teeth behind your veneers strong and healthy. Also, schedule regular dental checkups so your dentist can ensure the integrity of each veneer. A 1981 graduate of Baylor College of Dentistry, Dr. Robert C. Sikeshas nearly four decades of experience as a dentist. He strives to expand his knowledge by taking continuing education hours annually. You can find out more about how Dr. Sikes helps his patients get the smile of their dreams by visiting his website.